To know someone (in this case for nearly 20 years) can sometimes mean to not really know the person at all. I knew that Caroline Clarke was a foot soldier in the Black Enterprise clan. Married to Earl Graves’ middle son, Johnny, Caroline fit cozily into this black dynasty—not as a lady who lunches, though. As a highly trained journalist, Caroline began working for the titan of black business not long after graduating from Columbia University’s Graduate School of Journalism. Over the years she has had many editorial roles, now as executive editor and host of the brand’s Black Enterprise Business Report television show and shepherd of the Black Enterprise Women of Power Summit. But as a fierce advocate and defender of her family, Caroline never let on to any but the closest of her friends about her most intimate family secret. 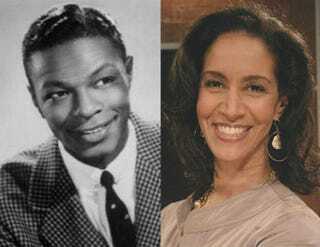 For starters, Caroline is adopted, and she discovered 12 years ago that her birth mother was Nat King Cole’s daughter. She tells the story of their relationship in her new book, Postcards From Cookie: A Memoir of Motherhood, Miracles and a Whole Lot of Mail. The story began to unfold when Caroline was a young mother. She had joint pain and wanted to find out its source. So Caroline, who has known that she was adopted since age 8, asked her mother, Vera, for her blessing to go to Spence-Chapin Adoption Services, the prestigious agency where her parents had gotten her, to see if she could learn anything about the health history of her birth parents. Whatever her motivation, Caroline says she didn’t expect much from the visit, because back when she was adopted, in 1965, adoptions were usually secret transactions laced with shame, and the records typically were held under lock and key. Though Caroline was not able to learn the source of the joint pain that brought her to Spence-Chapin, what she did learn was the stuff of fairytales. As she sat across from the representative of the agency, she listened to the woman matter-of-factly recite from a seven-page single-spaced document that suggested she was the child of a well-known black family of unparalleled privilege for that time in American history. Naturally, the 37-year-old professional didn’t believe a word of it at first. But the sleuth in her quickly figured out that if the tale she had just heard was true, then she knew who her family was. In her memoir, Caroline recounts in vivid detail how she connected with and came to know her birth mother, Carol “Cookie” Cole, the eldest of Nat King Cole’s four children, and ultimately develop an almost magical relationship with her. (She never knew her grandfather, the legendary singer, who died a few months after she was born.) Though, for many, discovering that you are kin essentially to black royalty would send you over the moon, the celebrity of her background was of little interest to Caroline. Meeting her birth mother, however, brought a depth of recognition and connection that proved to be even more profound than her childhood dreams. Within the pages of this beautifully told story, Caroline grapples with all manner of issues of identity, from discovering her birth mother and learning that she really did love her and never wanted to give her away to learning that her father is Jewish—another story that completely rocked the world of someone who had been assured that she was 100 percent black. To the question of why a very private person would share so fully about her own adoption story, Caroline says, “I just want to say to people, we all have shadowy parts of our lives where people tell us ‘Leave it be.’ You don’t want to look there, you don’t want to go there, you don’t need to know. And I think it’s worth uncovering who you are. It’s not to say that everything you find out is going to be perfect and it’s all going to go beautifully, but it’s going to make you more whole, and it’s going to help you heal in ways that you may not even have known you needed healing. “I didn’t think I had this deep need to know, but in knowing, I realized it was more the need that I was never willing to acknowledge,” she continues. “And for Cookie, my showing up proved an incredibly healing thing because here’s this woman who’d been forced to give up a child, who suffered tremendous trauma around that moment because her father died right afterward. She hadn’t been able to see him, be with him for months before that, because she was sequestered in a home across the country as a single pregnant woman, and it changed the course of her life in countless ways.